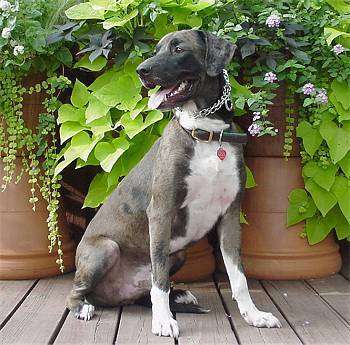 Catahoula leopard dog "Elmo" of Louisiana; photo by Dog Breed Information Center (all rights reserved; used by permission). The Catahoula leopard dog was designated the official state dog of Louisiana in 1979. Catahoula leopard dogs are bred to find livestock in any terrain - swamps, canyons, forests, or mountains - largest and most aggressive of the cattle dogs, they can handle wild cattle and hogs in the roughest country. Leopard dogs are the only native domesticated North American breed of dog - developed by Indians and early settlers. Leopard dogs are extremely agile and athletic, territorial, and protective. They come in all colors but are best known for a blue/grey base with black/liver spots ("blue leopard"), with tan legs and face, white toes and chest. It's common for the eyes to be two different colors. They're not good city dwellers - need several acres to run on, preferably with livestock to protect. Xoloitzcuintli: pronounced "show-low-eats-queent-lee" (also called Mexican hairless) - found in Mexico 3300 years prior to Spanish exploration. Peruvian Inca orchid: resembles a small deer in structure and movement (also called Peruvian hairless). Beauceron: a French herding dog colored black with rust stockings or merle / leopard. Red wolf: a medium-sized canid, the red wolf is smaller than the gray wolf. Males weigh between 60 and 80 pounds. Females weigh between 40 and 60 pounds. Carolina dog: most likely the "Indian dog" base stock which interbred with european immigrant breeds (also called the "American dingo"). The original Carolina dog is directly related to the Australian dingo and African jackal and was recently discovered surviving in uninhabited areas of the American southeast. "...This hound is a cross of a domestic dog the Indians of the Catahoula Lake region raised and a Spanish "war dog" that came through the area in the early 1500's."